Growing up in the Midwest, one generally does not have a great deal of exposure to southern foods. Meat and potatoes were most definitely on the menu, but not in the form of something like Country Fried Steak with creamy gravy. Yet, somewhere along the way, I was introduced to the incredibly delicious foods of the South. Many are loaded with butter, lard and bacon fat (all things that make foods so yummy), so it took me a while to start cooking Southern style. I had heard of Paula Deen and had devoured more fried food in her restaurant than I can write about, but it was watching Paula on television that hooked me to the joys of how she cooks. Or, perhaps it was simply the drawl that I got addicted to, since it was so different from the way I, naturally, speak. As much as I do l-u-u-u-uv the Southern foods, I generally do not cook quite that way. However, one recipe of Paula’s sons, the Deen Brothers, has become a staple in my house, namely their easy-to-make Chocolate Chip Pa-a-a-a-a-a-ie. I actually tried to find out how to write the word ‘pie’ with a Southern drawl. Unfortunately, I simply could not find it. I did the next best thing and made one up. A couple of years ago, I started baking Chocolate Chip Pa-a-a-a-a-a-ie with Samuel. At age 4 he was able to turn the mixer on and off and help add the ingredients by holding my hand. I always told Samuel that we were making Chocolate Chip Pa-a-a-a-a-a-ie, saying it just the way it is written here. We would then sit down to dinner and Samuel would announce to my other children that we were having Chocolate Chip Pa-a-a-a-a-a-ie for dessert. Every time Joshua would correct Samuel on the pronunciation of the word ‘pie,’ Samuel would tell his beloved biggest brother how wrong he was. It drove my ‘bigs’ crazy, because Samuel would turn to me and ask if he was saying it properly and I always confirmed that he was right. 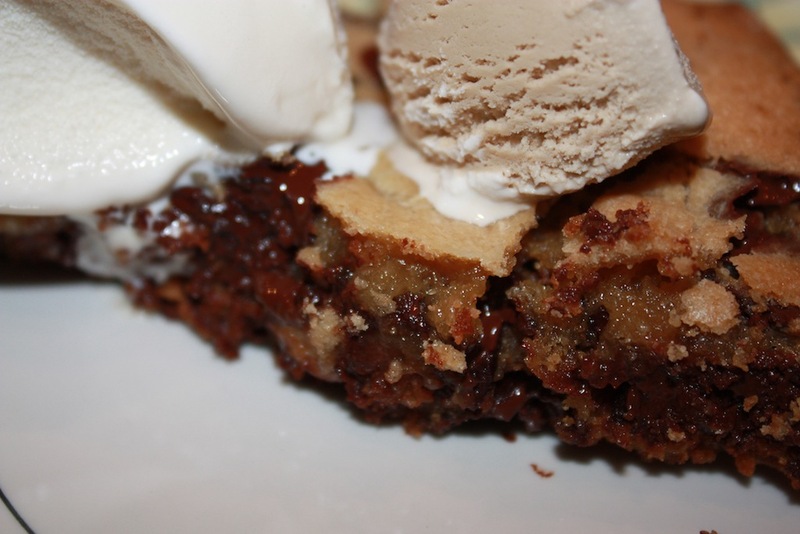 There is only one way to pronounce this dessert: “Chocolate Chip Pa-a-a-a-a-a-ie.” Give it a shot. I am confident that you, too, will embrace the drawl when you announce what dessert you are serving. Preheat the oven to 350°. Butter two 9” pie plates and set aside. Whisk together flour, salt, baking soda and baking powder. Set aside. Beat the butter, brown sugar and sugar in a large mixing bowl until creamy, about three minutes, scraping down the bowl as needed. Blend in the eggs. Add the vanilla extract. On low speed, mix in the dry ingredients. Lastly, add the chocolate chips. Divide the batter between the two pie plates. Bake at 350° for 30 minutes, rotating the pie plates halfway through. The Chocolate Chip Pa-a-a-a-a-a-ies will have a lovely golden color. If the pies are getting too dark before the 30 - 33 minutes, tent foil over them. Cool for a bit to allow the pies to set. Serve warm with vanilla ice cream. Chocolate Chip Pa-a-a-a-a-a-ie freezes beautifully. Thaw in the refrigerator and then warm it up again in a 250° oven. This gives the pa-a-a-a-a-a-ie that ‘fresh baked’ taste and makes your kitchen smell heavenly. Vanilla and/or coffee ice cream is not absolutely necessary, but seriously, can you think of anything that would compliment a warm Chocolate Chip Pa-a-a-a-a-a-ie better than this? This sounds great too. I’m off to the grocery store so chips are on the list! By the way, Keith said the lemon poppy seed cake was the best dessert I ever made! Thank you and keep posting! Thanks Alice. I love the feedback!